Transformers: Fall of Cybertron tells the story of the last days of a dying planet. It's the tale of two warring factions reaching out across the cosmos for the sake of survival. To fans of the franchise, this is a historical account of a fixed point in time, the outcome of which is predetermined. We know the ending of this story — it's been told and re-told countless times over the past three decades. This is the World War II of giant transforming robots. The outcome is not going to change. High Moon Studios approaches Fall of Cybertron in much the same way a screenwriter or novelist goes about crafting a compelling story set in one of our world's many historically significant conflicts, placing the focus on the individuals caught up in the battle. This is not a story of war. It is a story of warriors. Picking up where 2010's War for Cybertron left off, Fall of Cybertron finds the remaining Autobots and Decepticons desperately clambering over each other in an attempt to flee their dying world. For the noble Autobots this is a matter of finding enough life-giving Energon to sustain a journey across the stars. The Decepticons, with resources to spare, spend their time to make sure none of their enemies makes it off the planet alive. The game opens aboard the Autobot Ark, as the sadly mute Bumblebee (curse you, Hasbro) fends off a Deception boarding party. It's a prelude to the main story that serves as a tutorial, getting players acquainted with the third-person shooter mechanics of the game. It's also as close to the oft-criticized repetitive gameplay of War for Cybertron as Fall gets. As Bee battles his way from one pitched firefight to the next it seems as if the game is going down that same path. WHY: It's the grown up version of grabbing a bunch of Transformers from your toy box and acting out the final days of their doomed home world. What I played: Completed the storyline on normal difficulty over the course of five or six hours. Played several hours of multiplayer, both guided by High Moon Studios folks and on my own. Completed 15 rounds of Escalation Mode. Lit our darkest hour. No two characters in story mode played exactly alike, and there are quite a few characters. Every pitched battle felt like it had a purpose — I never felt like a fight was there just to add a couple minutes of play time. We want our multiplayer vehicle abilities back! Multiplayer lobbies are restricted to a single game type. This is fortunately not the case. High Moon Studios has learned from prior mistakes. Post opening credits the story takes us several cycles prior, following a diverse cast of Autobots and Decepticon characters as they make their way towards that inevitable confrontation. Each new playable robot brings something fresh and new to the battle. Optimus Prime orders orbital bombardments and commands one of the greatest weapons of mass destruction Cybertron has ever seen. Cliffjumper infiltrates Decepticon installations using stealth and subterfuge. Jazz uses his energy tether to traverse delightfully vertical levels. Soundwave ejects the tiny robots that call his body home, commanding them to attack any Autobot foolish enough to cross his path. The massive Grimlock swings his sword to build the rage needed to transform into a rampaging mecha-dinosaur. 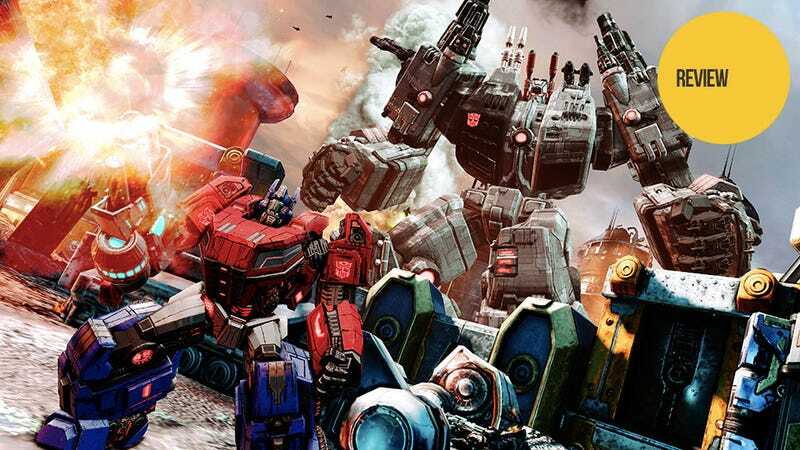 Where War for Cybertron's story mode felt like a series of battles tossed in my path in order to lengthen the period between opening and closing credits, I found myself eagerly anticipating each new chapter of Fall of Cybertron. High Moon has managed to marry story pacing and gameplay in such a way that no moment feels wasted. Every bullet fired, switch flipped, and target destroyed is absolutely essential to reaching the grand conclusion. The game is filled with spectacular moments, many of which we've already seen during its promotional period. The Combaticons combining to form Bruticus. The gargantuan Metroplex heeding the call of the last Prime. And those are just the cinematics. There are playable segments, such as the Decepticon Swindle's efforts to take down a vehicle easily a hundred times larger than himself, where you just have to pause for a moment and take it all in. As with any war story, however, the finest moments are the more human ones. The Transformers franchise is based on toys that change form, but the real appeal is the very human character these mechanical monsters have been instilled with over the years. Fall of Cybertron does a fantastic job of portraying the humans hiding inside these more-than-meets-the-eyes machines. Optimus Prime is stoic and contemplative, unleashing his true power only when those that look to him as leader are in peril. Jazz and Cliffjumper are comrades in arms, trading barbs that might as well be clanky mechanical hugs. Starscream is a power-hungry backstabber on the brink of madness. Perhaps Grimlock serves as the best example of humanity in robot form. Twisted and tortured at the hands of a mad scientist, his intelligence sacrificed for strength, his first concern upon breaking free of captivity is the safety of his brothers-in-giant-robot-arms. The story and spectacle all come together in the game's finale, the most satisfying series of events I've experienced in a Transformers video game. The unique online multiplayer experience of War for Cybertron returns in Fall of Cybertron, streamlined and refined to the point that fans of the first game might be a little disappointed with some of the major changes. Most notable among these changes is the lack of special abilities in vehicle form, one of the core features that made the original experience so novel and exciting. With special skills limited to robot form and vehicle weapons that don't feel nearly as potent as their hand-mounted counterparts, vehicle forms are useful for travel but not much else. Once I overcame my initial disappointment, however, I found myself having a great deal of fun charging into battle against human opponents, shouting "Being shot in the face is the right of all sentient beings" as I unloaded my robot shotgun. The competitive game modes shine the spotlight on the fast-paced shooting the single player experience shies away from, with a handful of entertaining game modes to choose from. Unfortunately multiplayer lobbies are dedicated to a single mode each, so if you want the group you are playing with in Team Deathmatch to follow you into a round of Capture the Flag you've got to disband the lobby and send invites to everyone involved. Also returning from War for Cybertron is Escalation, the four-player cooperative horde mode in which players earn points and then spend them on unlocking new areas and upgrades in an ever-evolving arena. This time around players take on specific roles — healer, ammo supplier, tank — meaning working together is more essential than ever. Making it through all 15 increasingly challenging levels is a true bonding experience. The pieces of plastic that filled my toy box as a child were more than just toys. Each colorful figure liberated from that battered wooden prison had a story to tell. I gave them dreams. I gave them voices. Though Hasbro laid the groundwork, I gave them personalities as diverse as their functions. There was a war going on, sure, but I was more concerned with the characters than any overarching purpose, even one as grand as survival of the species. After playing Transformers: Fall of Cybertron, I get the feeling that the High Moon folks feel the same way about their toys.